The skins of all beaver, bobcat, coyote, fisher, fox, marten, mink and otter must be tagged within 10 days after the end of the season on each species. Tags must be attached to the skins of these furbearing animals before you are allowed to sell them, give them away, send them anywhere or take them anywhere. There is a 25 cent tagging fee for each skin. Note: The skins of all bobcats taken by hunting must be tagged within 72 hours from the time they were taken. Skins of other furbearing animals (muskrat, opossum, raccoon, red squirrel, skunk and weasel) do not need to be tagged. All beaver must be tagged within 10 days of the final closing date on beaver. For example, if beaver are allowed to be trapped in some districts until April 30th, all beaver skins, regardless of where they were taken, must be tagged by May 10th. When purchasing a trapping license, 25 temporary marten tags and 10 temporary fisher tags are also provided. One of these tags, signed and dated, must be immediately attached to each marten and fisher at the time the animal is removed from the capture site. This temporary tag must match the number indicated on the trapper's license. This allows the trapper to keep the marten until they are able to have it officially tagged by the Department. Trappers who are not required by law to have a trapping license (residents under 10 years of age and residents trapping on their own land) may use, in lieu of the official temporary tag, a substitute tag (string tag) on which the name and address of the individual and the date of harvest has been clearly written in ink. 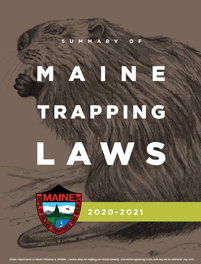 The skins of furbearing animals harvested in another state or province must be tagged in that state or province before being brought into Maine. If that state or province has no tagging requirements, the skins must be tagged in this state. The tagging of imported fur applies only to those eight species for which Maine requires tagging. Note: Skins imported by taxidermists solely for taxidermy purposes do not require tagging. Skins may be tagged while still attached to the carcass, but it may make it difficult to properly prepare the skin if it has already been tagged. If a skin will be frozen at the time it is presented for tagging, even if it hasn't been removed from the carcass, a popsicle stick, tongue depressor, or similar object should be inserted from the mouth hole through one of the eye holes before freezing. Removal of the stick at the time of tagging allows the tag to be inserted in the skin without thawing it out. Tagging agents may refuse to tag frozen skins which have not been prepared in this manner. Bobcat and otter must be tagged by Department personnel. Other furs may be tagged at one of the many fur tagging stations which are located throughout the state, see Fur Tagging Stations. In addition to fur tagging stations, furs may be tagged at any regional office of the Department and, through prior arrangement, by any Department game warden or wildlife biologist.